Plug your iPhone into your computer using the USB cable. In iTunes, click the little iPhone button near the upper-left corner of the iTunes window. Once you've selected your iPhone, the summary screen will appear in iTunes. 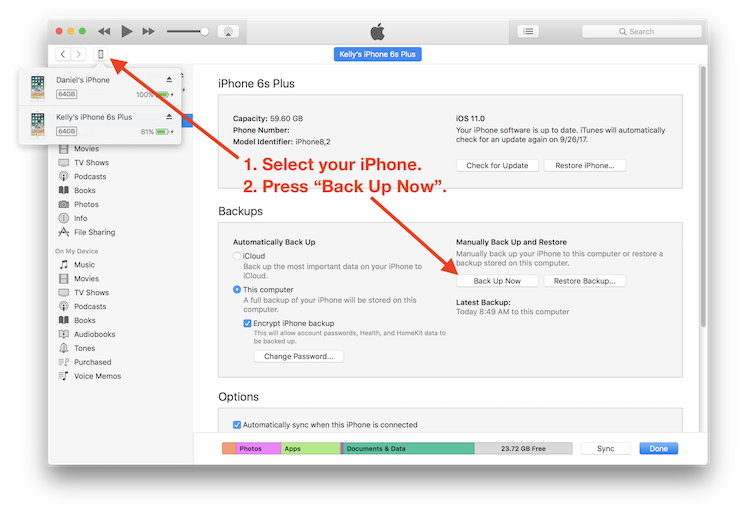 In the Backups section, press the Back Up Now button. You can also make a backup using the iTunes menus. Select File > Devices > Back Up. You may see a big welcome screen asking whether you want to set up your phone as a new phone, or restore from a backup. You should choose to set it up as a new device. Scary as the choice sounds, this won't wipe your phone, it just adds the iPhone to iTunes. If you're in doubt, please feel free to contact us and we'll help guide you! You can also make backups over wifi if you're unable to plug the phone into the computer often. You can read about how to set up wireless syncing and backing up in one of my previous articles. Download the free trial of Decipher TextMessage from our download page. If you're running Windows, open the downloaded installer to start the installation process. If you're on a Mac, open the downloaded DMG and follow the instruction to drag the Decipher TextMessage icon into your Applications folder. On Windows, you'll have a shortcut added to your Start Menu and/or Desktop. On Mac, your icon should be in the Applications folder in Finder and your Launchpad (or wherever you chose to put it in step 2.) You can also run directly from the downloaded DMG on a Mac as well. As Decipher TextMessage starts up, it will immediately start importing your text-message data from your iTunes backups automatically. Then, you'll be presented with a listing of your devices that you can click on and find the conversation you want to print. Select your iPhone in the left column. If you need to print iPhone text messages with multiple people, you can either print each conversation separately, or combine text messages with multiple people in chronological order. Press the Export button > Export Current Conversation > PDF to create a PDF of your iPhone text messages. Then, open and print the PDF file using File > Print. We recommend this method for printing iPhone text messages since it balances ease of use with flexibility in choosing your print options. If you want plain text with no formatting, press Export > Export Current Conversation > Text Only. Double-click the text file to open it in WordPad/NotePad/TextEdit and select File > Print. If you want total flexibility with the formatting of your printed text messages, or need copies of the full-size photo and video attachments you can also choose to export the conversation as HTML so you have complete control over how you print the text messages. This is the Export > Export Current Conversation > Text, Photos, and Attachments option. Open the resulting HTML file and select File > Print. On Windows if you plan to print with Google Chrome, in Decipher TextMessage, click "Preferences" and check the option "Use Newer Print Styles for Printing in Safari/Chrome" for a more modern iPhone chat bubble in the printout. In Chrome, you should see the same formatted conversation as you would see in Decipher TextMessage. You can bring up printing by pressing Ctrl+P or by pressing the button in the upper right that looks like three dots, and then selecting Print from the drop down menu. If you don't see color chat bubbles in the print preview, check the print options checkbox that says “Background Colors and Images” — it's usually toward the bottom of the options.